Happy September! Today I am teaming up with Bondi Lifestyle to share a fun, new beach trend with you all called Kaftans! You’ve been planning that beach vacation for so long, and in your mind you are swanning around the resort pool, cocktail in hand, looking elegantly cool and relaxed; and on the beach, you’re taking in the sun and walking hand in hand down the ocean’s edge looking tanned and gorgeous with beach style. Getting that beach fashion look is completely attainable if you plan and pack right. 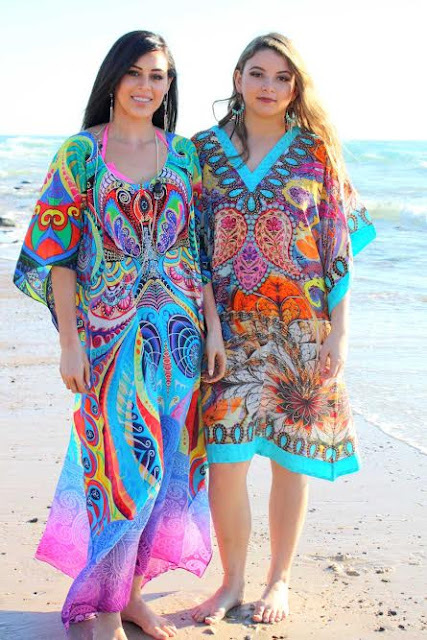 Our best advice is to get onboard with the latest in beach fashion trends with Kaftans. With their versatility, easy to wear structure and flattering shape, it’s no wonder that Kaftans are having a beach fashion moment right now. 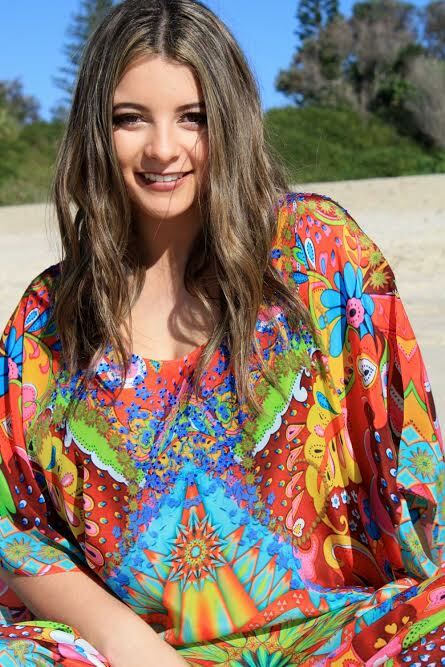 Usually made of cotton or silk, kaftans are cut in a straight and wide shape, usually with a deep v-neck line and batwings so they can slip over your bikini or swimwear perfectly and allow you to breathe. 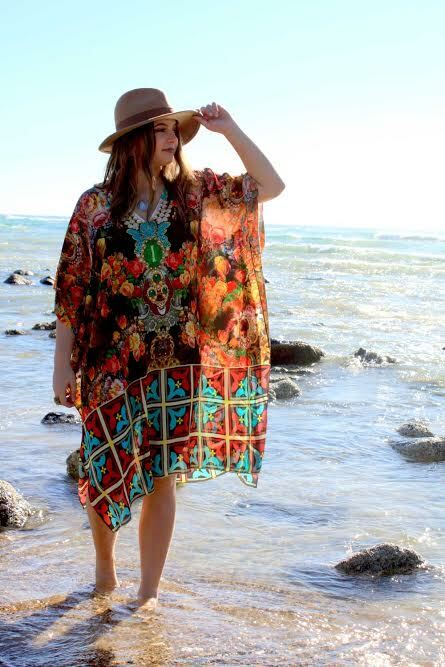 Because they don’t hug your shape, kaftans are perfect for every shape and size and are particularly gorgeous as a plus size fashion choice for the beach. To give your kaftan a little more shape, you can add a belt or sash around the waist. Wearing a kaftan is easy! Slip your kaftan over your swimwear and you’re ready for a day at the beach. Because most kaftans are bright and colourful, they are often enough by themselves to add that sparkle to your beach look. However, if you’re heading out for lunch or dinner, rather than the beach, you can accessorise a kaftan easily by adding stacks of bangles, big bright earrings and metallic sandals. If you’ve chosen a maxi kaftan, you may not need anything but a slip underneath, but if you have chosen a midi or short kaftan, think about adding a pair of your favourite jeans or leggings underneath to give you a little more coverage. There are so many styles of kaftans available right now. 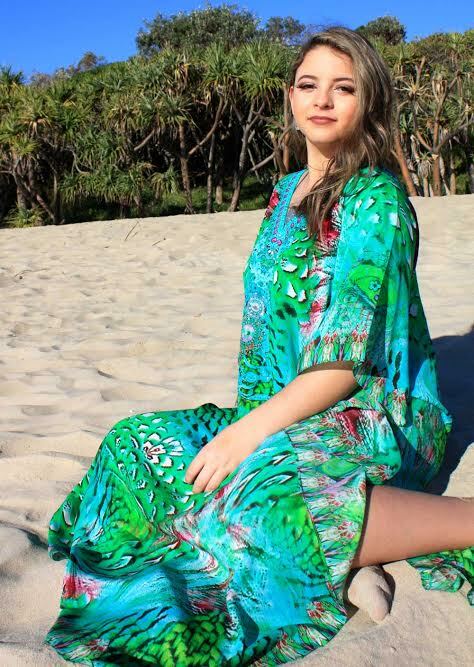 The most popular are a midi length, square shape silk kaftan that means you’re going to be comfortable at the beach no matter how hot the day gets. The loose fitting shape is flattering and breathable, perfect for relaxing, sitting, walking and playing. This shape and style is popular as a beach style for good reason! You can also look at a maxi kaftan for a more resort elegant look. The long shape of a maxi dress without the clinginess is becoming a phenomenon for beach weddings, dinners and elegant nights out, as well as resort holidays. The long maxi kaftan gives you a distinct look that will take you from beach to night out, and you can easily style your maxi kaftan with a metallic chain belt or a colourful silk sash along with lots of metallic necklaces and a cocktail ring for a look the glitterati love. Choosing the perfect kaftan is easy! If you’re after a more casual look, select a cotton or linen kaftan in a short or midi length. For a more elegant look, choose a silk maxi kaftan. Either way, you’ll find colours and patterns to suit your look from bright to subdued, and from boho and indie to glitteringly elegant. The shape of a kaftan means they are perfect to buy online as they flatter every shape and size and you won’t have any issues with ill fitting garments. Go on and try a beach kaftan. I swear it will become your favourite beach fashion choice this year. Head over to Bondi Lifestyle right now and buy your favorite Kaftan before Summer is over!